Home Video Watch: Dottie Pepper Gets The Ride Of Her Life From Bill Murray. 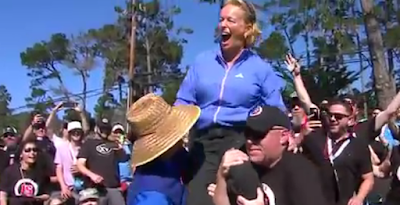 "Pass Her Back"
Watch: Dottie Pepper Gets The Ride Of Her Life From Bill Murray. "Pass Her Back"
Dottie Pepper Goes Crowd Surfing. Bill Murray seems to be a complicated guy but you have to hand it to him for his ability to get the crowd going. Maybe he had a bit of making up to do with the Tour after smashing the phones of two fans who took his picture last Wednesday! Yesterday he instigated Dottie Pepper crowd surfing. She's loving it!